Our Plissé retractable door screens are the ideal solution for screening Atrium style doorways. 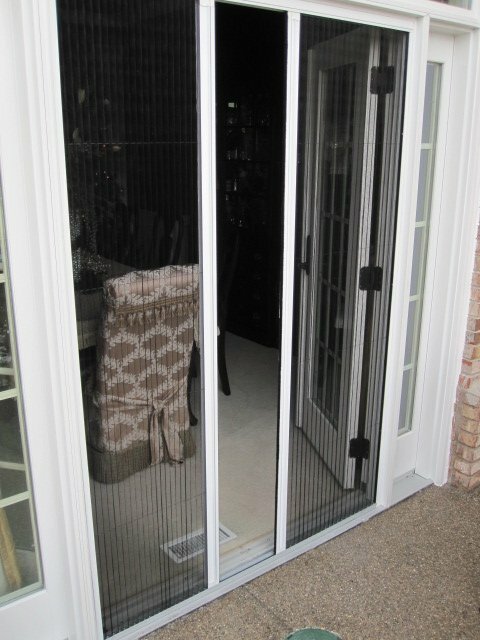 Retractable atrium door screens virtually disappear when not in use but provide maximum bug protection when in use so that you can open your doors, and your home, without worry. And since the Plisse’s revolutionary design means there are no springs to fight or dampeners and magnets to fail, you can count on your screen lasting for season after season. Every custom built, patent-pending Plissé retractable screen we ship comes with our lifetime warranty and free FedEx Ground shipping. Traditionally, an atrium door is a double door with one fixed door and one door that opens. 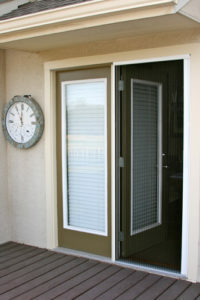 These doors usually come with a fixed screen door that slides over the fixed door when not in use and then over the open door when in use. The trouble with this is that you always have to see that screen, whether your using it or not. Furthermore, those screens are clunky, unattractive and have a tendency to rip, tear and fall off their track. 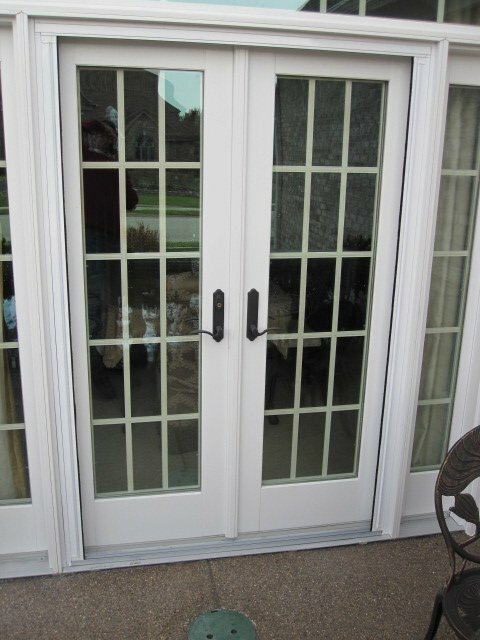 This is why retractable atrium door screens by Screen Solutions are so perfect for atrium style doors: you simply hide the screen away when you aren’t using it so you are blocking your view through your fixed door with a screen all of the time nor are you blocking your nice looking door. Because Doug the Screen Guy is so passionate about retractable screens and providing the best possible product and experience to his customers, he’s also designed an optional adapter that makes installation on atrium style doors a breeze. Pun intended. The optional surface mount adapter allows you to install one side of the Plissé retractable door screen’s frame to your fixed doorway and only screen the side of your door that opens. This not only saves you money but makes for a nicer overall finished look. Below are a few pictures of our Plisse retractable atrium door screen installed on an Atrium style door (click images to see a larger view). Read on for more information on our surface mount adapter which makes installation a breeze and the final look clean and elegant. 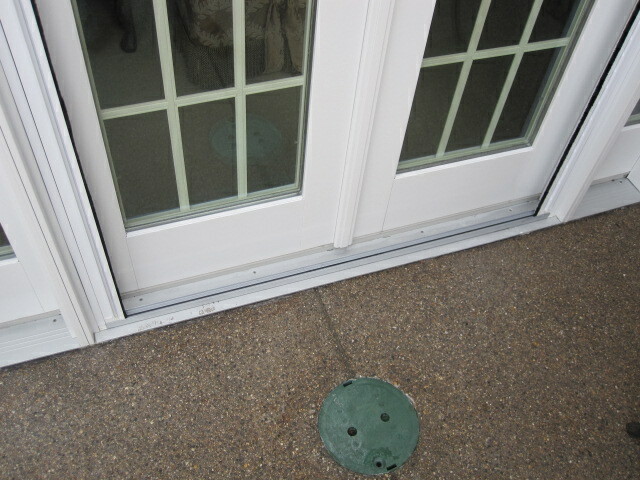 The following drawing shows the placement of the Screen Solutions Surface Mount Adapter on an Atrium style door. 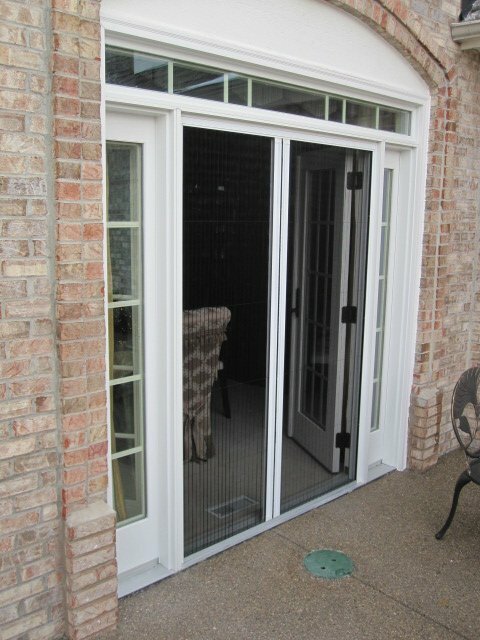 All orders including the optional surface mount adapter will come with it already installed on your retractable screen, making installation simple and straightforward.